So, since the Boy was visiting for a few days, and since it was almost his birthday, and since I knew he LOVED Gyro sandwiches, and since I knew he had been dying to try this vegan version, which they don't sell in Albuquerque... well, what can I say? I decided it was a good reason to treat him (and me!) to something fun and different. 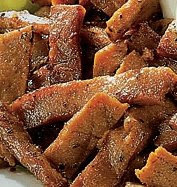 The product is a nicely seasoned strips of some seitan-sort of veggie "meat". I have to admit, I was skeptical that these little bits would have any spectacular flavor as I tend to pooh-pooh commercially made seitan products. They never seem to be seasoned enough for my "salt" tooth, or flavored to my liking. Well, it certainly didn't impress me when they all stuck together in a funky blob when I dumped them into a fry pan to warm them up. (There are no cooking instructions on the package.) I admit I raised my eyebrows. But, after they warmed up and simmered in the bit of "sauce"...Wow! Let me give them a total thumbs up review!! The flavor was RIGHT ON and the texture was great, not as rubbery as seitan can be, and yet not squeamishly meat-like either. Probably one of the best faux-meats I've tried. We made these really cute little sandwiches, (because mini-pitas were the only vegan ones I could find). Sorry for the unusually bad light but I was in a hurry, dammit. 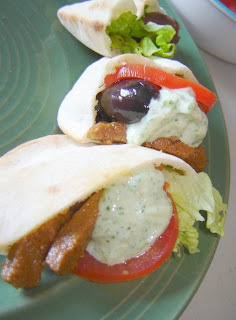 We loaded them with tasty bite-size amounts of Gyro "meat", lettuce, onion, Greek olives and some chunky homemade Tzatziki sauce and oh, my gosh... they were delightful! Perfect! Definitely will have to make them again! I'd say one package feeds two generously, because we were quite stuffed. As for the vegan Tzatziki sauce? One of the first recipes that came up when I Googled, was a great looking one from Vegan Dad's blog. I went with a similar idea I confess, but since I changed up the recipe quite a bit (due to having different ingredients and I don't like dill) I thought I'd post it. For the record, his looks excellent too - in case you don't have the ingredients for mine! ~ About 2/3 of a carton Tofutti Sour "Cream"
Cut onion and (peeled if you want) cucumber into chunks. Put fresh herbs, cucumber and onion in bowl of food processor. Coarsely chop vegetables and herbs in food processor by pulsing off and on just a few times as needed. (I like it chunky). Remove vegetables from food processor and set aside. Put Tofutti Sour Cream, tofu, lemon juice, garlic, and spices together in food processor and blend until creamy. If too thick, add a splash of soymilk, though the cucumber will "juice up" and make the dip thinner as it sets. Mix vegetables with creamy mixture. Serve. If waiting a while to serve, stir well before serving. Hope you all have a great night, and "Kalispera", which loosely translated, means Good Evening in Greek. I must confess, I miss gyros (or probably just all the toppings). This looks fantastic! veganized gyros?? BEYOND genius. yum!! I just found a link on the web for vegan gyros. I was thinking of trying them. Actually I think the recipe orginated from Vegan Vittles. I plan on making these sooner now that I have see yours. Our stores don't carry this product. What store did you get yours at? Thanks for the tip and the thumbs-up. I've also had trouble in the past with packaged seitan, but I'll take your word on this one and give it a try! there is Viana in the US? English friends of mine didn't know the brand, so I assumed it's only available in Germany and Austria (Viana is a German company)... thanks for the revue! I haven't tried that gyros for salty-tooth reasons, either. i was just telling my hubby that i wish i could have a vegan gyro. i'm so gonna make that tzatziki sauce with some falafel! this looks so yummy! after your great review, i'd love to try that mock gyro meat. oh, and i love that we both posted about vegan tzatziki (admittedly, you posted much more thoroughly about it!) within a few days of one another! :D great minds think alike! i usually don't like dill either, but tzatziki and potato salad are my two exceptions to the rule. your photos look great- what bad light? oh, and the gyros sound SO good. I just saw tzatziki on Textual Bulldog's blog, and now yours- the universe wants me to make this right now! Oh how I loved Gyros! Wow, I didn't know Viana ships its products all the long way to the States, too. Thank you for the review I think I should grab a pack next time I am at the store! And make some tzatziki too. Yummy. 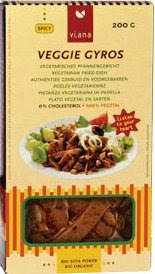 Just happened upon your blog.....I was looking for recipe help for veggie gyros! I can't believe that I actually came across someone else that is as passionate about vegan cooking as I am. I have created, changed, & improved upon so many recipes to get good vegan food. Looking forward to checking your blog to see what tasty tidbits you post next!